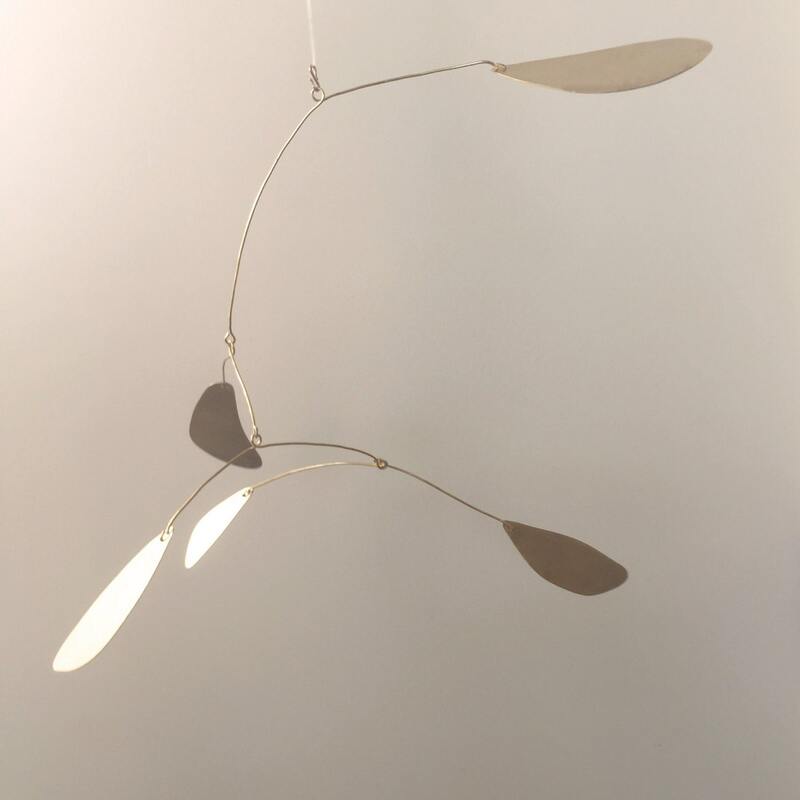 Inspired by the playful art of Alexander Calder, this delicate handmade kinetic sculpture is beguiling in its simplicity. 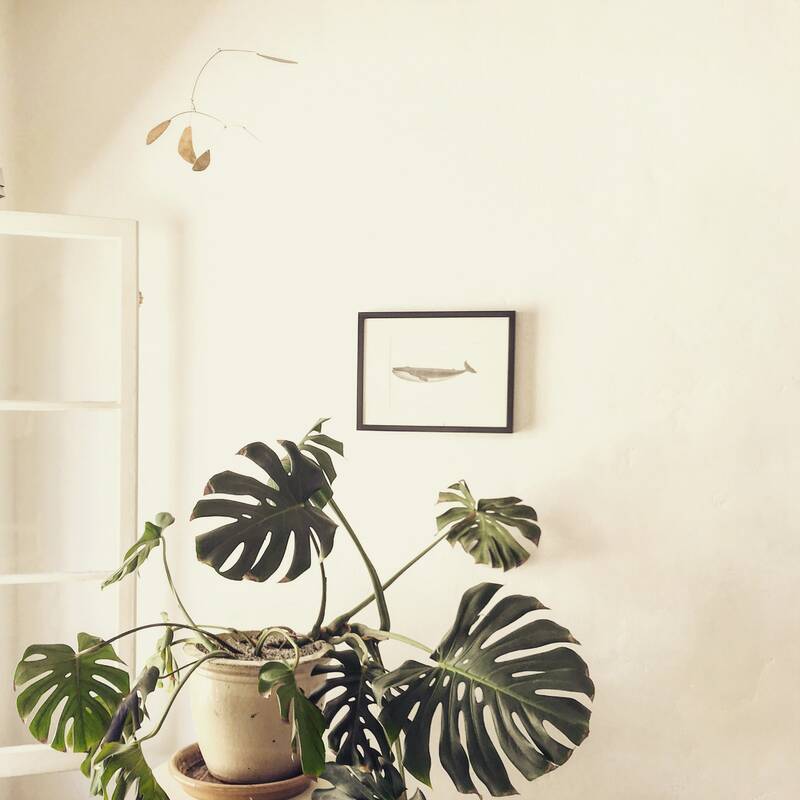 Each mobile is inspired by the natural world and the underlying patterns and elements both seen and unseen. These biomorphic shapes are cut from brass sheet and the edges softened and shaped. Every mobile is carefully assembled with brass wire and balanced by hand. When animated by air currents the mobile dances in a pattern of elegant motion through its articulated design. They are designed to be equally pleasing to behold when motionless and are born from the principles of sacred geometry and equilibrium. 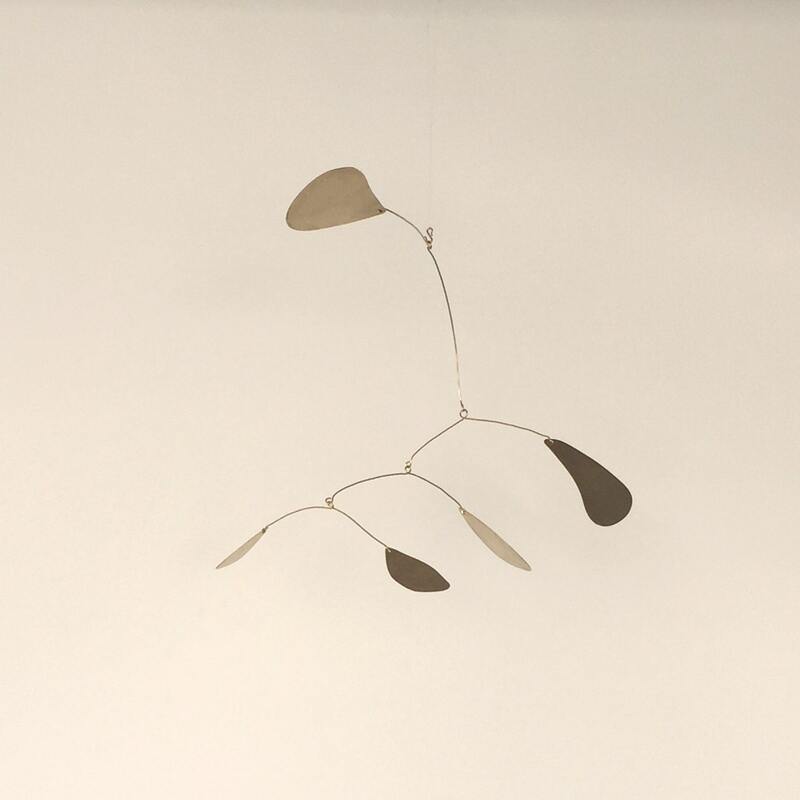 Mobiles can be hung from an invisible monofilament to enhance the perception that it floats on air. 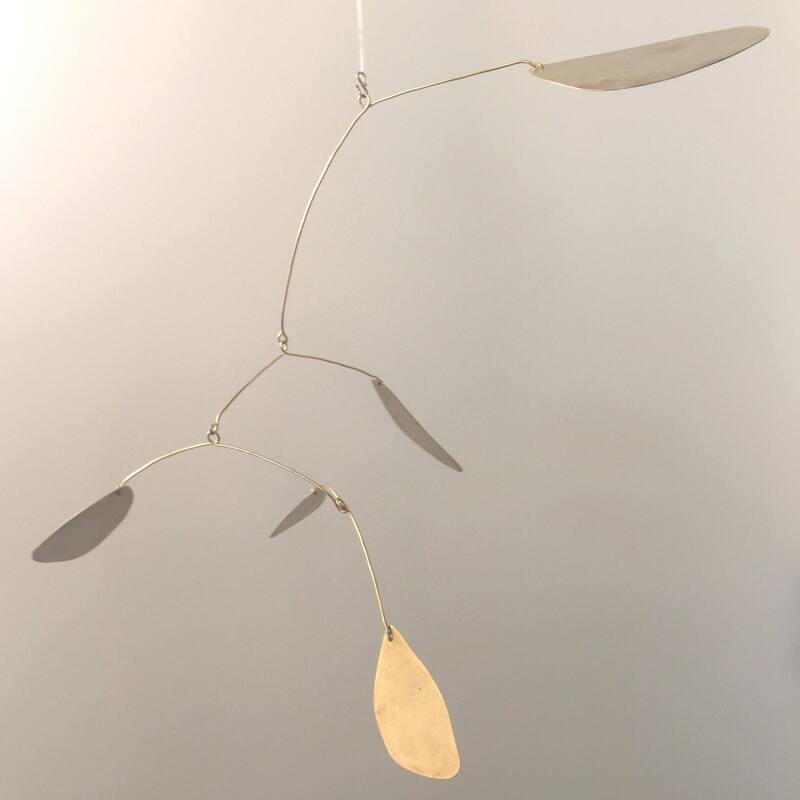 Mobiles are available in two sizes (small and medium) and two finishes - a natural finish, which has a slight patina to it and will continue to develop naturally over time, or a bright finish that maintains the original warm gold color and satin sheen. To keep your sculpture bright, you may use a brass cleaner like Brasso from time to time. They can be enjoyed outdoors or inside, though exposure to the elements will speed the evolution of a patina. Please contact me if you’re interested in a different base metal such as aluminum or copper or if you'd like to have a plated finish such as silver or gold, which will affect cost. To email you with shop and product updates from time to time. You can always opt out. For wholesale inquiries, please email marisa@welkinandmain.com or visit my shop on Etsy Wholesale. Forged and cut brass items have a "living finish" meaning they are unsealed, allowing them to develop a unique patina over time. If you wish to maintain the original bright finish, you can use a jewelry polishing cloth to clean from time to time. I recommend one like Fabulustre. 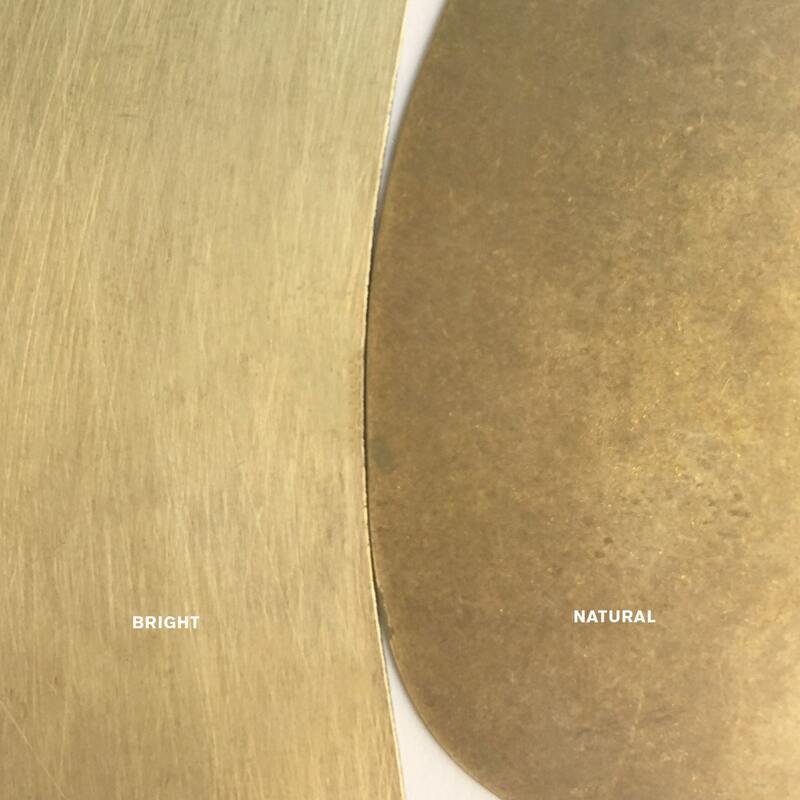 If you've let the patina develop but want to quickly bring it back to original brightness, a product like Brasso (found in most hardware stores and some grocers) works very well and is very fast and inexpensive.